No matter where you live there is never a shortage of landscaping businesses. With generally low barriers to entry, it seems everyone has a landscaping business on the side or is the full time owner of a landscaping company. Combine a highly-competitive industry with one that can be extremely seasonal and effectively marketing your landscaping business becomes critical to survival. After much research and an interview with a current owner of a landscaping business, we’ve laid out some keys to success in marketing your business. We’ve included answers from Nick Miller, owner of M&M Landscaping. Look for the “Nick Says” sections for his thoughts on how to market and grow your landscaping business. The peak season for landscaping businesses is going to differ based on location and climate, but it is generally going to last from early spring to early fall of each year. Maximizing business during this time is critical. Most landscaping businesses have zero revenue during the off season, unless there is a complementary business such as snow removal or even Christmas décor during the holidays, etc. This seasonality dictates that landscaping businesses start to market their company and promotions well in advance of the beginning of the season. Lining up media buys, printing marketing collateral, and planning out major promotions during the off season will allow landscapers to focus solely on servicing clients during the peak season. Failing to do so will reduce revenue and potentially lead to business failure without profit to cover the lean off-peak months. Nick Says: We do a little bit of advertising throughout the year. We do advertise a little more heavily in the early spring in anticipation of the peak season. It’s well known that the cost to acquire a new customer is significantly higher than retaining a customer. 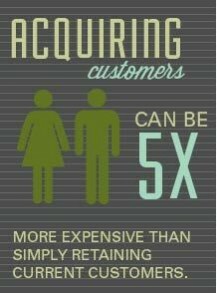 Acquiring customers can be as high as five times more expensive than simply retaining current customers. 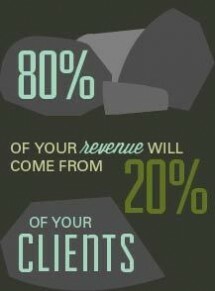 When combined with the 80/20 rule where 80% of your revenue will come from 20% of your clients, it becomes critical for landscapers to retain a base of loyal clients. There are multiple keys to doing so; we’ve detailed a couple of important ones below. First, try and diversify your business between residential and commercial clients. While there will be some residential clients who employ a landscaping business, most residential customers will be one-time clients needing sprinklers installation, yard prep, or sod laid. Alternatively, commercial clients will almost always work with a landscaping business to ensure their grounds are well-kept to meet city guidelines and display their business professionally. Due to their inherent need, commercial clients become much easier to retain, though more difficult to land, assuming your landscaping business does a good job. Nick Says: It’s good to have a mix of residential and commercial clients. Even though there are fewer commercial jobs, they are generally larger and more in depth than residential. This helps with revenue as well as building a stronger portfolio, which of course leads to more work regardless of whether it’s residential or commercial. Second, use the human touch. Landscaping businesses, unfairly or not, are often stereotyped by work crews that may have language barriers or workers who simply aren’t social butterflies. If this is the case for your landscaping business, ensure that you are the one that communicates and forges the relationship with the client. Work on building relationships through the entire process — from the initial contact to project completion. Not only will this attach a face to the company and create a relationship, but it is also a way to create a network that could lead to future business. Building a relationship can help you to gather word-of-mouth referrals on the spot (either naturally or through some kind of employee referral program) or build goodwill for future referrals. Regardless of the immediate impact, there is no doubt that building relationships is critical to the long-term success of a landscaping business. Nick Says: Maintaining an ongoing relationship with repeat customers is very important. There is no overhead in retaining these customers, and they are more likely to refer their friends and family to us for their landscaping needs. Personally, due to our situation our most effective way of marketing would have to be through word of mouth from our current and past customers. Once you have a satisfied customer, they won’t go anywhere else. Brochures and door hangers have also been very effective in our marketing efforts. Perhaps the most important key to success when growing your business is both branding and advertising that brand in a professional and cost-effective way. There are as many ways to market your business as there are businesses. However, before discussing a few of these, it should be noted that no method of branding is going to be effective unless your business appears professional and legitimate. Poor quality marketing materials or even a barely-functioning website can erode trust and turn off prospective customers before you even have the chance to sell them on your track record of service. So whether you’re a two-man team or a 100-employee-strong franchise, ensure that you convey professionalism at all times. Perhaps the easiest way to market your landscaping business is to place yard signs in the yards you service and commercial properties in which you regularly work. From a residential stand point this can often lead to many new customers if the home is in a new subdivision where neighbors and friends throughout the neighborhood aren’t far behind in looking for a landscaping business to help put the yard in. For commercial properties, signage can help open doors for adjacent buildings and businesses who may otherwise do it themselves or be working with another company. Not only is this an effective way of advertising but a cost-effective one. With permission from the property owner and a few signs, increasing visibility and potential leads requires little effort. Landscaping businesses are perfect for car advertising. With a fleet of trucks, trailers and equipment, different forms of car advertising can go a long way to increasing brand awareness and generating leads. A well-designed car wrap for the trailers, car magnets for the trucks and even decals for machinery can advertise to neighbors, passersby, and business owners who may not have the time to inquire or are hesitant to approach someone while they’re working. There are several benefits of using car advertising that can help grow a business, even more so for a landscaping business that travels to the customer and not the other way around. Whether you use yard signs, car advertising or both, remember to keep your signs simple enough that potential customers can contact you. The name of your company, a phone number, and your website should be sufficient information for someone who already has interest in contacting you to inquire about services. I would agree. Signage is extremely important in this field. We have our logos on our trucks and equipment as well as putting signs on completed landscaping jobs. We have a marketing team that puts out a lot of flyers and door hangers in the early spring as I alluded to earlier. Additionally, to set ourselves apart we pride ourselves on customer satisfaction, so we will do what it takes to make sure the customer is happy. Keeping up with the continued education that is offered as well as having all the required licensing are some of the other ways we set ourselves apart from other landscapers. I’ve also seen guerrilla type marketing tactics work well also. To point, one of the most creative ways of advertising that we have seen is to use telephone poles and the local grocery stores to promote your business. The flyer pulls you in to read it because initially you think it’s an ad about a lost pet, but as you get closer to read it, the flyer is actually promoting your business. While careful planning, relationship building, and offline signage can go a long way in growing your business, landscapers shouldn’t forget digital marketing. The challenge of digital marketing is twofold. With the tremendous growth in digital marketing, the first challenge is to avoid scammy and too-good-to-be-true services or companies. In particular, avoid companies that guarantee online results or promise pricing that is way out of sync with what others are offering. Rather, look for a digital marketing company that can offer a wide variety of services yet display expertise in each area. Some portions of digital marketing can take a long time to show results and its important that your marketing company is transparent in what they are doing for you. If you decide to do some internet marketing yourself, then make sure that you educate yourself on what does and doesn’t work. There are some basics which small business owners can follow, including tips for building a professional and crawlable website, local citations and business listings and even creating blog content. Should you decide to try some search engine optimization, it is important to know what exactly is within search engine terms of service. For landscaping businesses which are local, a particular emphasis should be placed on local citations and following best practices for local online marketing. All of these things can help increase online visibility and all it will cost you is time and a willingness to learn. No matter what digital tactic you decide to pursue or allocate budget to, remember that the same principle of professionalism discussed above applies. Your digital assets, online banner ads, website, social media accounts, etc. will be from what people judge your company and ultimately decide whether they contact you. While it may seem easy to start and run a successful landscaping business, it is actually an extremely difficult company to run successfully. Keeping in mind these tips on how to market your business by planning in advance, developing human relationships, taking advantage of the inherent mobile car advertising and leveraging digital marketing can lead to long-term growth despite the competition. Nick Says: I think both traditional and digital marketing have the potential to be very effective. Digital marketing is great because you can reach a large amount of people and a larger geographical area in a short amount of time. Traditional marketing is best for us because, we work in a more small tight knit community and most of our customers are by word of mouth or by being known in a small town. But it will vary based on the circumstances of each respective company. Nick Miller is Founder and Owner of M&M Landscaping Inc. M&M can be reached at 801-471-7980. They serve areas stretching from Lehi to Santaquin in Utah.